More than 60 years had passed since John Chamberlain had first catched the eye and intellect of people from all around the world and since then he has been one of the most important modern artist we know. Starting in 1955 Chamberlain studied and taught sculpture at Black Mountain College, near Ashville, North Carolina, where most of his friends were poets, among them Robert Creeley, Robert Duncan, and Charles Olson. Since 1957 when he started to include scrap metal from cars in his work he is filling the most renowned galleries with art lovers hungry for his abstract art…. From 1959 onward he concentrated on sculpture built entirely of crushed automobile parts welded together. Acclaimed in the ’60’s, Chamberlains works were exibitetd from the beginning in museums and art galleries such as the Museum of Modern Art in new York, the Sao Paulo Biennal, the Vennice Biennal, Leo Costelli Gallery in New York or The Guggenheim Museum in 1971. By 1987 his works have been represented by The Pace Gallery. Beginning with1963 and until 1965, he made geometric paintings with sprayed automobile paint. 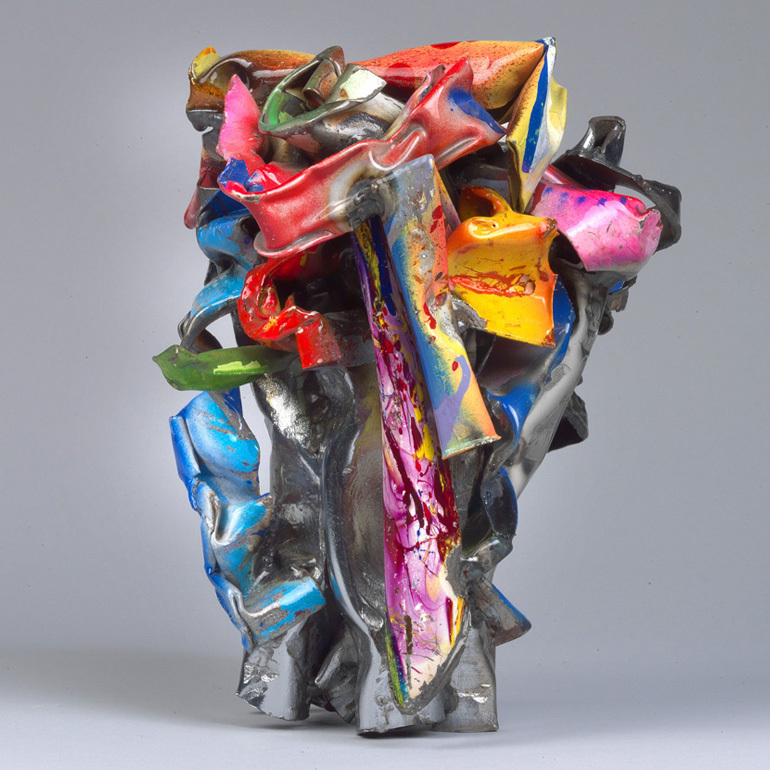 In 1993 John Chamberlain received the Skowhegan Medal for Sculpture from The Showhegan School of Painting and Sculpture and a John Simon Guggenheim Memorial Foundation Fellowshiop in 1966 and 1977.